The Southwest Healthcare Services Sports Medicine Team. (L to R) Dr. Jennifer Jahner, Patty Gilbert (PA-C/AT), Dr. Darrin Criswell. The Southwest Healthcare Services Sports Medicine team can be seen on the sidelines at Bowman County Bulldog home games. They also see athletes at the school for injury evaluations and strength & conditioning consultations. 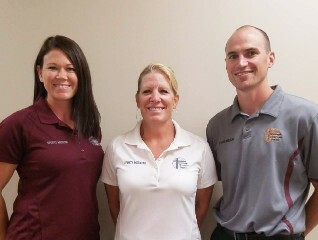 Dr. Jen Jahner, Patty Gilbert (PA-C/AT) and Dr. Darren Criswell form the trio of sports medicine providers that help keep your athletes in the game. Proper treatment for athletes may require seeing a physician or physical therapist at Southwest Healthcare Services. Some insurances DO NOT require a physician referral to seek treatment from a physical therapist. Jennifer Jahner, PT, DPT. Dr. Jahner participates in annual sports medicine continuing education. She has experience as a trainer with the National Jr. Olympics. She's a former collegiate athlete and prep hoops coach. Dr. Jahner is also the Director of Rehabilitation with Southwest Healthcare Services. Patty Gilbert, PA-C/AT. Gilbert has more than 20 years of athletic training experience. She was a Justin Sports Medicine Athletics Trainer. She's impact injury certified and participates in annual sports medicine continuing education. Gilbert also specializes in allergy and asthma diagnosis and treatment with Southwest Healthcare Services. Darren Criswell, PT, DPT. Dr. Criswell has completed an advanced course in sports medicine education and participates in annual sports medicine continuing education. Criswell sees patients for various rehabilitation needs at the rehab facility at the Bowman Medical Clinic of Southwest Healthcare Services. Knowing a little about diet, exercise, and preparation can do a lot for athletes wanting to stay off the injured list! Proper hydration plays an important role in the body functioning adequately. Dehydration causes muscle fatigue, reduces coordination, and causes muscle cramps. Inadequate hydration can also compromise the body's ability to cool itself through sweating which can lead to heat exhaustion or stroke. Stretching lengthens the muscles and tendons to increase range of motion of joints. Stretching helps heat the muscle up to prepare it for activity. The act of stretching can also promote blood flow to working muscles. It can also help to relieve soreness of muscles after a workout and cool the muscles down to reduce the risk of injury. Protein is an important macronutrient that helps with muscle repair, muscle growth, and preservation of lean muscle mass. It can also help immune system response. Protein after a workout can play an important role in helping your muscles recover. Eggs, lean meats, and nuts are excellent sources of protein. Also known as the Sunshine Vitamin, Vitamin D is important for boosting your immune system, improving bone health and preventing inflamation and other diseases. Everyone should be outside at least 15 minutes daily to get enough Vitamin D.
Vitamin D can also be found in small amounts in foods such as fish, and added in milk and cereals.